Every day, individuals and brands are creating and publishing as many as 27 million pieces of new content online. It’s no wonder that one of the biggest challenges content marketers face today is getting their content seen. So what can your brand do to stand out and get a customer’s attention, and ultimately turn that engagement into sales for your business? Onalytica asked ten of the influencers they’ve identified in their Top 100 Influencers and Brands to share their content marketing insights and top tips to help you improve your own content marketing efforts. I’m very honored to be asked to share my views this year, and also really excited to see, learn and speak along with some of these great content marketing influencers at the Content Marketing World this week! “Behind the the simple 2 words…”content marketing” is a discipline that has become an art and a science. The art is the creative process of crafting of words, visuals, videos and audio that humans and brands use as the honeypot to attract traffic and build credibility and trust. The science is the technology that enables businesses to optimize and control their strategies at scale. This includes tools and and digital marketing automation platforms that are needed for managing the splintered media channels and networks that we are now confronted with. But many content marketers are not paying enough attention to the science of conversion and just banging out blog posts and hope they work in some way. All the traffic and the engagement from persistent content creation and marketing needs to be turned into real “ROI”. Leads and sales. Big brands often have the luxury and budget to just use content for brand awareness. But small and medium entrepreneurs need to focus much more on getting a return. If you don’t focus on that then the rest is just vanity metrics and noise”. Content is powerful. The right content, distributed the right ways, in front of the right eyeballs can build a business, spread a message, even change the world. But that reaching those right eyeballs is getting harder and harder, because in spite of the growth in content consumers, there’s a vastly greater growth rate in content creation and the noise saturating those distribution channels. For content creators, the message is clear — hitting the publish button on your amazing work is only the start of the process. Onalytica was interested in finding out which content marketing influencers and brands were leading the discussion online. They analyzed over 410k tweets over the last twelve months, mentioning the keyword “content marketing,” and identified the top 100 most influential individuals and brand who were leading the conversation on Twitter. Onalytica found that there was a very engaged community with discussions taken place between brands and individuals. 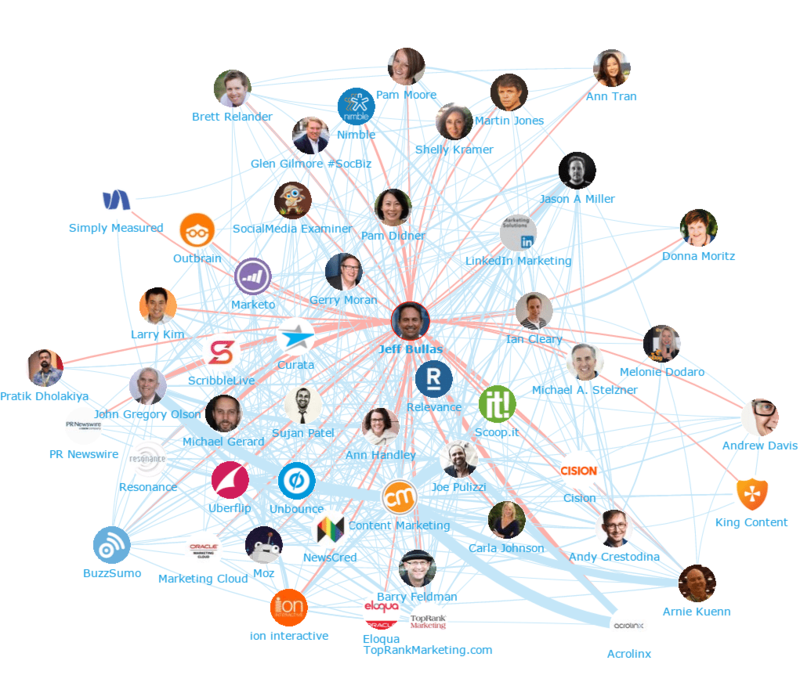 Using their Influencer Relationship Management software (IRM), Onalytica has created the network map below, showing the #1 influencer Jeff Bullas at the center and the online conversations to and from the influencers in his network. Here’s the list of the top 50 content marketing influencers Onalytica has identified, based on their analysis of all the individuals engaging on Twitter. To see the complete list, click on the download link below. Onalytica was also interested in finding out which brands were the most influential in content marketing, and below you’ll find the top 50. Download the full report to see which other brands made the top 100 list this year. Will you be at the Content Marketing World this week? If so, I’d love to meet you all so please come by and say hello! Interesting list. Many of these have large followings but almost no engagement with their accounts. Seems strange to consider someone an influencer if the stats show they influence almost no one. This is an issue many influencer programs miss. They assume a large following makes someone an influencer when it simply isn’t the case. Hi Ben, I can understand that it would seem that way on the surface. Follower size is only one metric used to calculate influence by Onalytica. They also look at overall engagement on their content (among other things). So audience size matters but only in helping to achieve an overall engagement with content.